When you’ve got a body of work spanning several decades and an iconic status, how do you decide on your concert’s opening number? Look no further than where it all began, the first number off of Roxy Music’s first album — the world’s first introduction to the band. 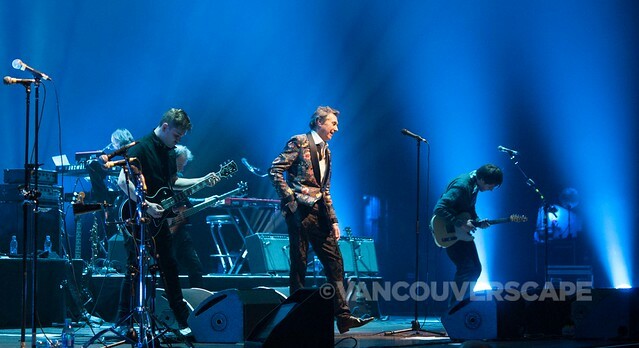 Roxy’s frontman Bryan Ferry kicked off a sold-out, 90-minute performance at the Queen E Theatre in Vancouver on Saturday night with Re-Make/Re-Model, and then led the audience down a parade of numbers, including three more from that first, timeless album (Ladytron, 2.H.B., If There is Something). 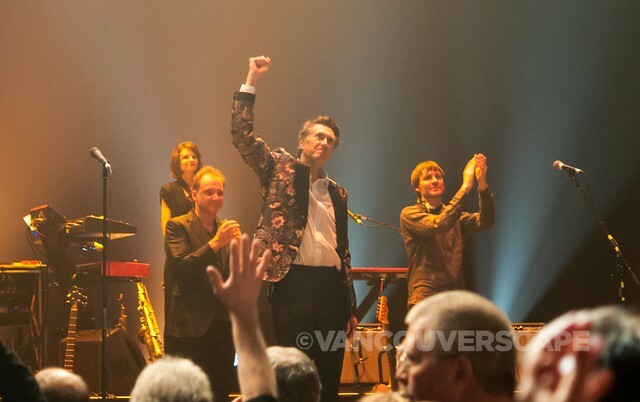 This is Ferry’s first North American tour in three years, following the release of last year’s The Jazz Age. 1972 revisited the Queen E for one magical night, as Bryan and his band kicked off a short tour (aptly-entitled Can’t Let Go) that will take them to the States, including two shows at Coachella Valley Music Festival. One of the evening’s many highlights included In Every Dream Home a Heartache, with those haunting opening notes on the organ leading up to the song’s climax, bringing on the rush of the entire band bathed in purple and green lights. The climax pun is not lost on me; the song describes living the high life with an inflatable doll that becomes an inseparable part of it all. I’ve seen Ferry perform this song three times now (including a 2001 European Roxy Music tour); each time, the intensity of the song and the organ blow me away (another pun: the song leads to that one big line, “I blew up your body, but you blew my mind.”). 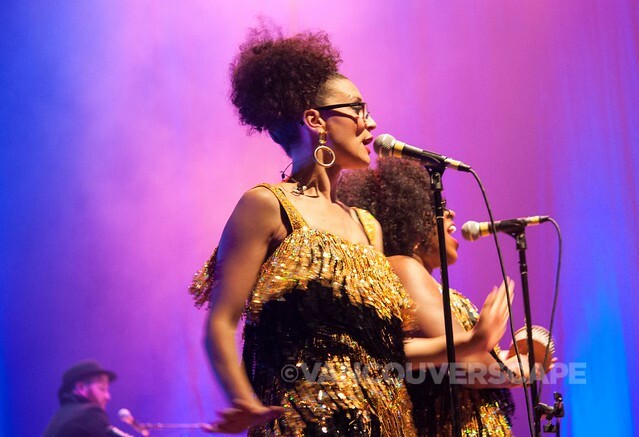 Tara, the final number on Roxy’s Avalon, set a soothing interlude with smoke and strumming guitarist, creating a lovely atmosphere that morphed into More Than This. While Kiss & Tell and Slave to Love might strike a chord with the younger fans, this packed crowd included long-time Ferry lovers well into their 60’s, enjoying some of the rarities such as the aforementioned 2.H.B. Ferry seemed more than happy allowing his band to shine, spending a good portion of the set in the background on his keyboard. 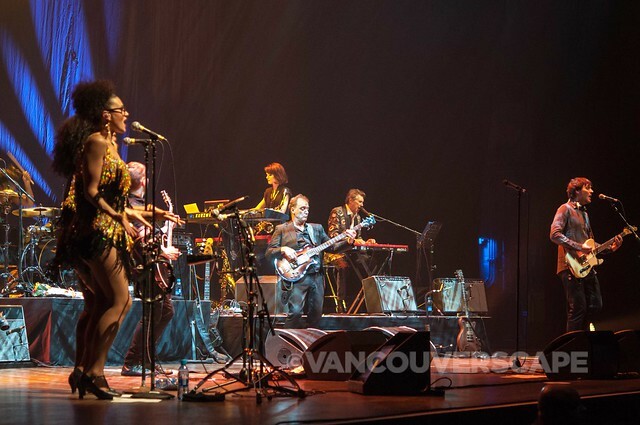 The eight-member band plus Ferry kept the flow of the songs going well until it was time to say goodnight, with two encores, Running Wild and John Lennon’s Jealous Guy to close off a memorable show that brought the Vancouver crowd to its feet yearning for more. The newly-formed band sound tight and groove well on stage together with the 68-year-old British frontman who will hopefully, in his words, fade away never. 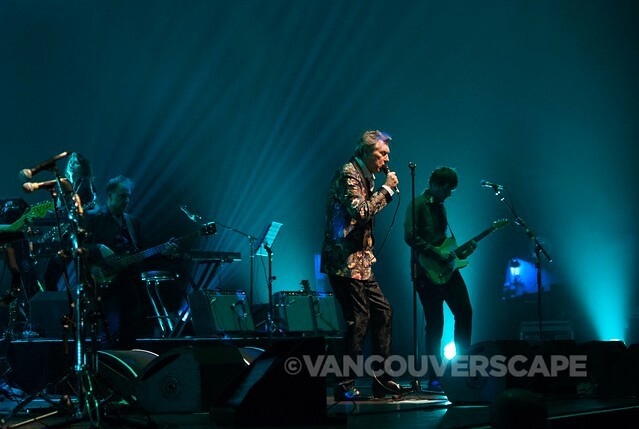 In case you missed Bryan Ferry this time around, he’s in the studio working on new material, which will hopefully mean future tours. Ferry is a charismatic performer who continually refines his work through both recording and performance. The calm, soothing sounds of Dawn Landes opened the show. Twilight closed her Bluebird Tour set (the name taken from her song Bluebird). She’s definitely excited about kicking off this tour together with Bryan Ferry; at one moment she sweetly apologized for accidentally launching into the ‘wrong song’. Although her brief set was warmly received, she didn’t seem to meld well with the second guitarist on stage in an unforgiving acoustic environment such as the Queen E’s. On a side note, Landes is currently on a Pledge Music drive. Fans who aid the folk singer will be able to get involved with her tour by helping to choose cover songs to go on her yet-to-be-recorded album, as well as download her EP, bonus tracks, video, etc. A portion of the proceeds will be donated to Oxfam America.